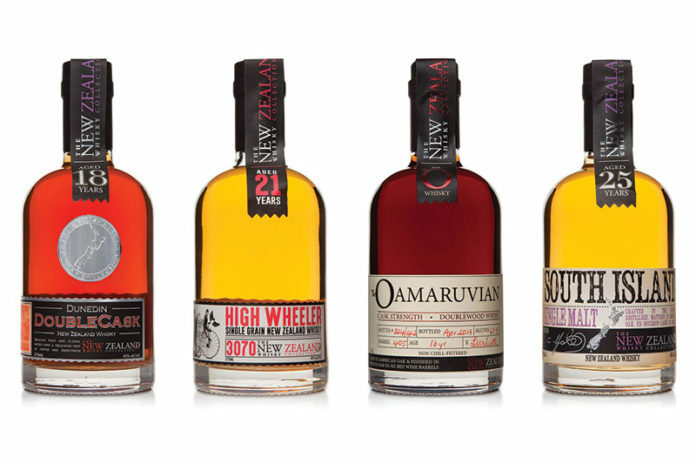 Home Spirits New Zealand Whisky Collection Launches in the U.S.
Beginning in August 2017, the award-winning New Zealand Whisky Collection will launch in the U.S. Imported through Anchor Distilling Company, the award-winning whisky collection is comprised of the oldest and rarest whiskies produced in the Southern Hemisphere. The New Zealand Whisky Collection features expressions produced between 1987 and 1994 at the Willowbank Distillery in Dunedin on the South Island of New Zealand. In 2010, New Zealand Whisky Collection founder Greg Ramsay discovered and purchased the last 443 barrels of cask strength whiskies at the distillery, which had been mothballed at the end of the 20th century; Ramsay saw the potential for the complex range of flavors among the quietly maturing barrels. Today, this extensive stock of old and rare whiskies is continuing to mature in a seaside bondstore in Oamaru, on the eastern coast of New Zealand. A blend of 70% single malt and 30% grain whisky (made from unmalted barley in the Willowbank Distillery). After aging in American Oak for 6 years, transferred to French Oak ex-New Zealand red wine casks for 12 Years, resulting in a stunning ruby color and distinctive layers of aromatic dried fruit and spices. Also a blend of 70% single malt and 30% grain whisky (made from unmalted barley in the Willowbank Distillery), this expression is aged in American Oak, ex-bourbon for 21 years, which gives an elegant balance of baked pear and vanilla with gentle floral notes. The best casks are hand-picked for these unique single cask bottlings. A vibrant taste of dried fruits, including cherries and strawberries, intertwined with almonds and nutmeg. These whisky products will be available in major markets nationwide. For more information about this and other products imported by Anchor Distilling Company, visit anchordistilling.com.